Creatine monohydrate – You have liquid creatine, creatine candy, creatine gum, creatine capsules, and even stomach-bloating effervescent creatine (Give this a try, I guarantee you’ll only do it once!). With all these “tricks” thrown at trying to market a “different” creatine – little has actually improved upon the effects of regular creatine monohydrate. The problem is, companies are trying too hard to make their creatine different instead of developing a creatine that is actually better. Creatine works by enhancing muscle cell hydration. It is very important to consume adequate fluids while taking creatine to see best results. A good rule of thumb is to drink and EXTRA 16 to 20 ounces of liquid for every 5 grams of creatine you take. With SAS Nutrition constant commitment to improve the effectiveness of sports supplementation we have developed a new creatine supplement. 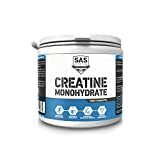 SAS Creatine Monohydrate smaller particle size means quicker digestion and faster utilization. SAS Nutritions Creatine has 20 times more surface area. Greater service area means easier, faster and more complete mixing.